Summer is not the season for me...especially, in Tokyo. The homes here don't have central A/C, public transportation and stores rarely turn the air conditioning on, and if they do, it's set to one degree lower than the temperature outside...I don't get it. The Summer sun has felt exceptionally cruel and relentless this year. So, this is my poor excuse to break my base makeup "no buy," and pickup a foundation for Summer. I really wanted something to give warmth to my complexion (I've tanned just walking seven minutes...yes, I timed it) to my grocery store), and provide a thin veil of coverage. 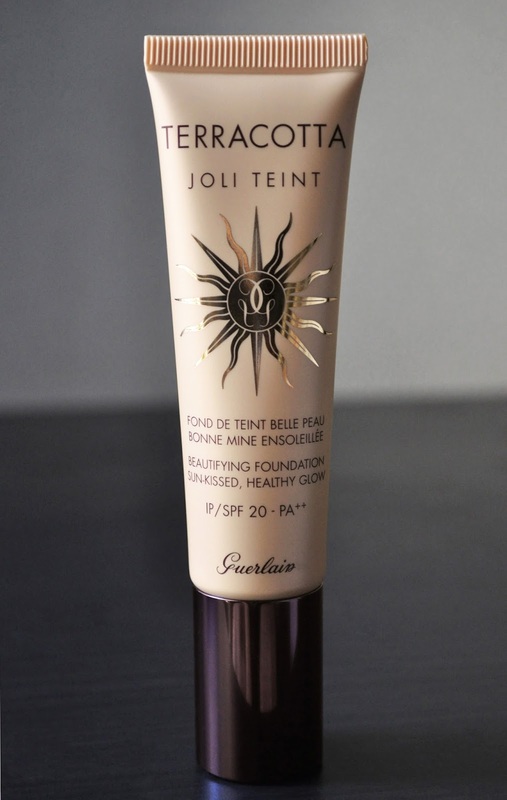 At first, I was going to repurchase Guerlain's Terracotta Skin Healthy Glow Foundation (love this one), however, I went with the new Terracotta Joli Teint Healthy Glow Fluid Foundation SPF 20. 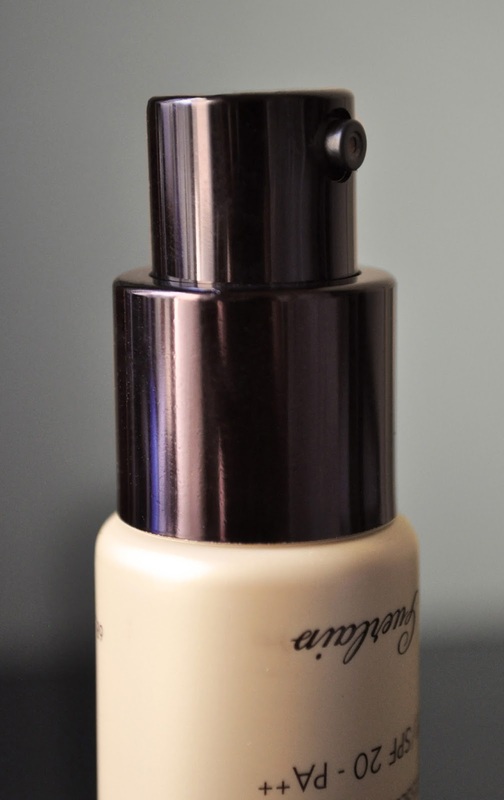 The Terracotta Joli Teint Healthy Glow Fluid Foundation SPF 20 hasn't made it's way to Japan, so, I got mine from the states. I love the plastic tube packaging, and that it has a pump; making it travel friendly. I chose the shade in Natural, a little dark for me, but I make it work by blending it down the neck and onto my ears. I use only one pump of foundation, and my phalanges to spread and press the product onto the skin. The Joli Teint provides high sheer coverage that smooths, corrects and even-outs the complexion. If you have any problem areas, you will need to go back and spot-correct. Keep in mind, the inside of my area is a lot lighter that my face. I've only been using this foundation for two weeks and, so far, I like it. 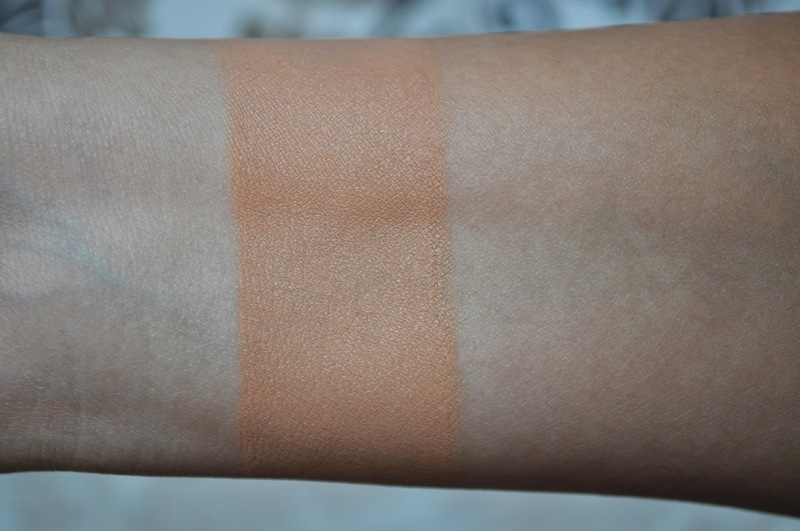 The shade stays true and doesn't oxidize, but gives subtle warmth to the skin. The Joli Teint has a soft, luminous-satin finish, however, I have noticed that throughout the day (both indoors and outside), my skin looks dewier; this can be remedied by using a setting powder or blotting papers. Personally, during Summer, I stay away from setting powers (bronzers are okay), as the mixture of power and sweat is a catastrophe waiting to happen. However, I like the extra luminous sheen as it looks more natural. What are some of your favorite tinted moisturizers, bb creams and foundations for Summer? My favorite foundation for summer is chanel vitalumiere aqua! Keeps me matte and natural looking.